After thirteen heart-wrenching hours of watching dysfunctional teenagers in the series 13 Reasons Why, I needed a palate cleanser! While they don’t make movies like the ones John Hughes made back in my day (The Breakfast Club, Sixteen Candles, Ferris Bueller’s Day Off), there will always be a market for teen coming of age films. One story that always promises drama is a teen love story threatened by illness. 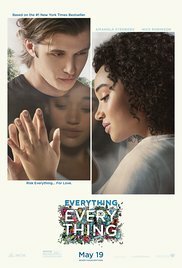 Based on the best-selling YA book, Everything Everything tells the tale of Maddy (Amandla Stenberg), a girl who has lived almost all of her 18 years inside her home due to a disease that compromises her immune system. Her only human contact is with her physician mother Pauline (Anika Noni Rose), her nurse Carla (Ana de la Reguera) and occasionally Carla’s daughter Rosa. Maddy keeps herself busy by reading, surfing the internet and taking an online architecture course as she lives within the four walls of her safe house. Maddy seems resigned to her fate until new neighbors move in next door. The family includes the quite handsome Olly Bright (Nick Robinson) who takes a liking to the mysterious girl in the window. Olly is persistent in his attempts to befriend Maddy, and before you know it, the two are texting and flirting regularly. With the help of her sympathetic nurse, Maddy and Olly eventually meet in person without her overprotective mother’s knowledge. When Pauline does learn of the meeting she quickly puts an end to their flirtation by firing the nurse and taking away Maddy’s cell phone. But parental interference can’t stop true love (just ask Romeo and Juliet!) and before you know it Maddy has decided to fulfill her dream of seeing the ocean by traveling to Hawaii with her beloved. Nothing like jumping in all the way with this gal! Maddy buys her first swimsuit and the couple happily frolic in the surf. They spend the night together in a tastefully filmed love scene (but still a love scene FYI). The romantic Hawaiian getaway ends dramatically with Maddy hospitalized. She returns home to her safe house convinced that she can’t ever see Olly again. From there, the final act of the story takes a completely different turn which changes everything and I mean everything about her life. First the good news. Amandla Stenberg (most known for her portrayal of Rue in The Hunger Games) is absolutely lovely as the naive young girl learning to love. Her chemistry with Robinson is sweet and their budding relationship unfolds naturally. Unfortunately, it’s very difficult to show a romance blooming via texts so the director employs imagined scenes between the two that take place inside the architectural models Maddy creates. This distracts from the simplicity of the love story. Of course, since texting is the mode of communication for teens, maybe that won’t seem that odd to the target audience. I also found the relentless use of close-up shots annoying. Sure, these teens are beautiful and wrinkle-free but give me a wide angle every now and then—especially once you are showing the enormity of the outdoor world to the sheltered Maddy! I also wish that we got to know Olly better. We learn that the gorgeous yet sensitive rebel has a chaotic family life, but we know so little about him that he seems almost unreal and too good to be true. These issues aside, the biggest problem is the twist in the third act. It really comes out of left field and is difficult to believe. Plus, this brings up a whole level of complexity to Maddy’s saga that just doesn’t fit in with the love story other than to create a quickly resolved happy ending. While teens will probably enjoy the sweet love story, as a parent I just wasn’t as emotionally invested in the film. For a truly gut-wrenching teen illness story that requires a stack of tissues, The Fault In Our Stars is far superior. Another sweet (and so delightfully sappy) love story about teens dealing with illness is A Walk to Remember. Both films do a much better job of highlighting the overwhelming and all-encompassing feelings of first love from both points of view while showcasing the complexity of illness. Springfree celebrates its first anniversary! The school bell has been rung!